It’s not very often that I can say this, well, once there was a salmon and spinach en croute thing that should NEVER be repeated but nonetheless I tend to be adventurous as well as optimistic in the kitchen. However, whilst trawling the aisles at the supermarkets I’ve always tried to look for something unfamiliar that I should be able to cook. 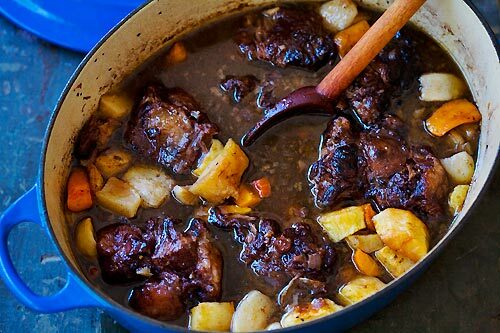 If I don’t have the skill set to cope with certain foods then it is up to me to research what it is that I need to do to be able to do to work with that ingredient and it was this supermarket-philosophy that I picked up ox-tail at my last food shop. Having researched online as to what treatment this cut of meat needed as to create the perfect winter warmer, I set about the task. Visually, this looked fatty and therefore I imagined would need several hours of slow cooking. I rushed home after work and dredged the ox-tail through seasoned flour and sealed the meat in hot butter and oil. In the meaty flavoured fat I gently fried the onions, celery and carrots (aka mirepoix). Once these were translucent I added the sealed ox-tails and added a glass of red wine, beef stock, seasoning and herbs. Whilst I had a much needed power-nap the ox-tails were stewing for the desired time (3hrs) in a low oven (180°C). I even added the potatoes within 45mins of the remaining cooking time as instructed by the online recipe. As delicious and welcoming as this pot looks it fooled me too! The meat was not falling off the bone as the recipe suggested. I made a mess of the shirt I was wearing as I tried to negotiate the meat from the sinew. My table cloth is also in need of a washing machine! I would not be much of a food writer if all I ever wrote about were my kitchen successes. If anyone can produce an ox-tail stew worth its credit please send me your recipe as I would be more than happy to try it again and give this meat the credit I have heard so much about.